I meant to post this story the other week. 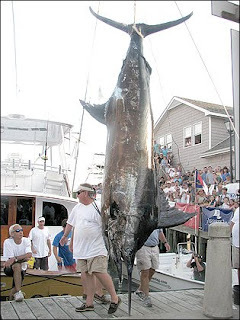 Apparently there was a guy fishing a marlin tournament in the Outer Banks, NC, and caught a whopper weighing in at almost 1,000 lbs. Only problem is that everyone on the boat needed a license to fish and this guy didn't have one, sooo, he lost $1 million. So my thought is that this one is the Captain's fault. I would assume on a big charter boat like that that the boat provided the license. Plus, when there is that much on the line, the Captain needs to double check that everyone is playing by the rules. Easy come, easy go. Man, i think Papa would have been proud of that fish.